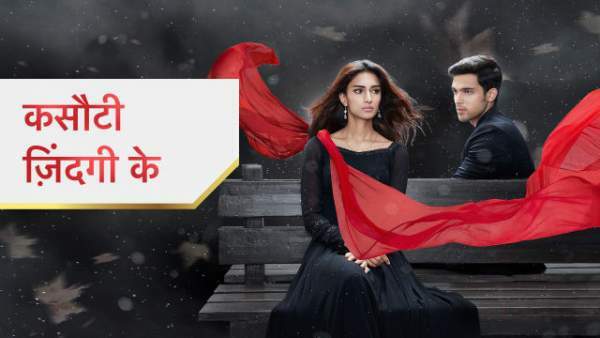 Kasautii Zindagii Kay 2 8th February 2019 Written Update Episode of Star Plus TV Hindi serial. The episode begins with Komolika asking for Mohini. Nivedita takes her upstairs to meet with Mohini. Prerna is about to remove the vermilion and recalls all the moments spend with Anurag when he has put vermilion on her forehead. She was about to wipe out the vermilion, but Anurag comes and asks her to let it be since it is looking nice. He says that it is their pre-announcement that Prerna is his. He says that he just wants this mark to stay there as he like it. He asks her not to wipe it out. He says that after seven days he’ll put the vermilion on her forehead. Prerna is blushing after hearing all this. He says that after seven days, they will unite and stay together in good or bad times. He imagines about the moment of their wedding as the groom and bride. Moloy was passing by but waits to hear what Anurag is speaking! Anurag says that both the families will be together and the priest will be chanting mantras. Anurag holds Prerna’s hand and starts performing the wedding rituals with her. Moloy gets happy to look at this. Shivani comes and looks at them. Prerna is standing in front of Anurag and Shivani thinks that they’re having a romance. Moloy is happy and dragging Rajesh in happiness. Rajesh is asking about his reactions. Moloy says that Rajesh has been promoted and turned into relative now from a friend. Rajesh is confused with it. Moloy says that he used to think that our kids are innocent but they are very mischievous. Rajesh says that they have gone on you. Rajesh says that he knows very well that it’s a drama that Moloy have plotted. Moloy denies and says that he has seen with his eyes when they were close to each other, embracing each other. Moloy says that Anurag has proposed Prerna and she acknowledged. Rajesh is happy to hear it. Moloy says that when they were kids, it was his wish that they establish a relation. Moloy says that he is proud of Anurag and he knows to keep his promises. Moloy also makes a promise to Rajesh that Anurag has made to Prerna after seven days to be prepared to welcome the groom’s family. Rajesh shows a happy reaction and Moloy asks him to keep his mouth shut and don’t say anything to anyone. Moloy adds that for the next seven days, Rajesh won’t do any office work. Rajesh questions that how will he do it alone? Moloy replies that listen to whatever I’m saying, otherwise, he will beat him. Rajesh gets emotional and Moloy asks him to dance. Nivedita calls Moloy and they leave. Anurag speaks to Anupam that he has expressed his love. Anupam is really happy with it and hugs him. He congratulates him, but Nivedita is looking for them. Anurag gives hints to Anupam about Nivedita standing behind him. Anupam changes the topic and says that he is not feeling well. Anurag asks him to relax. Moloy and Rajesh come there and Nivedita asks why he is so happy to Moloy! Moloy says that my wife is sick so I’m worried, not happy. Nivedita leaves and the doctor come outside. Everyone asks the doctor about Mohini’s health. The doctor says he has her injection and the glucose level is in control. The doctor adds that he has taken the blood sample for a blood test and after the test, they’ll get the reports which will reveal that what exactly happened to her! Anurag says that she was shivering before getting unconscious. The doctor says that there’s nothing to worry. Moloy asks Rajesh that he should go with Vinita, and Shivani and take a rest now. Everyone is leaving and Anurag is looking at Prerna. Moloy comes in front of Anurag and asks about the boy’s name who sees her but she is not there. Anurag says that he’ll introduce him to the boy, but first let’s go to Mohini. Komolika is talking with Mohini that she came here to check whether Anurag is fine or not. Komolika says that after coming here, she got to know about Mohini and so she came here to meet her. Mohini is happy for her concern. Mohini thinks that these sisters are so good and recall when Nivedita said everything about Prerna. Komolika recalls when Anurag was confessing his love for Prerna and thinks that it is only Komolika who can replace Prerna and she is someone who will compel Anurag to love her. Anurag comes at the moment with Mohini’s medicines. Mohini looks at Komolika staring at Anurag and is worried about Komolika’s interest in Anurag. Komolika says that Mishka couldn’t come here as she was at the party last night. Komolika thinks that Mishka has lost the battle still she will tell about her mother-in-law. Prerna is sleeping, but Shivani comes there and asks about the incidents between her and Anurag. Prerna reveals everything to Shivani. Mishka comes to meet Mohini. Nivedita informs her to meet Mohini in her room. Prerna gets ready and calls Anurag. She was about to cut the call, but Anurag picks the call. She says that she was about to call someone else but by mistake, it got connected to him. He teases her that he will hang up if she was calling someone else. She denies and says that she called him. She feels awkward to call him and Anurag loves it. He turns around and looks at Mishka hearing all this. Precap: Anurag confesses to Mohini that bonding is missing between him and Mishka. Mishka says to Komolika that she cheated her own sister. Komolika mix something in Mohini’s drink, which Prerna is serving for her! Mohini’s health got bad!